An exciting refurbishment or redevelopment opportunity that occupies one of the most sought-after, prime waterfront positions throughout the whole of the South West. For sale for the first time in 36 years. As featured in The Sunday Times and Country Life. 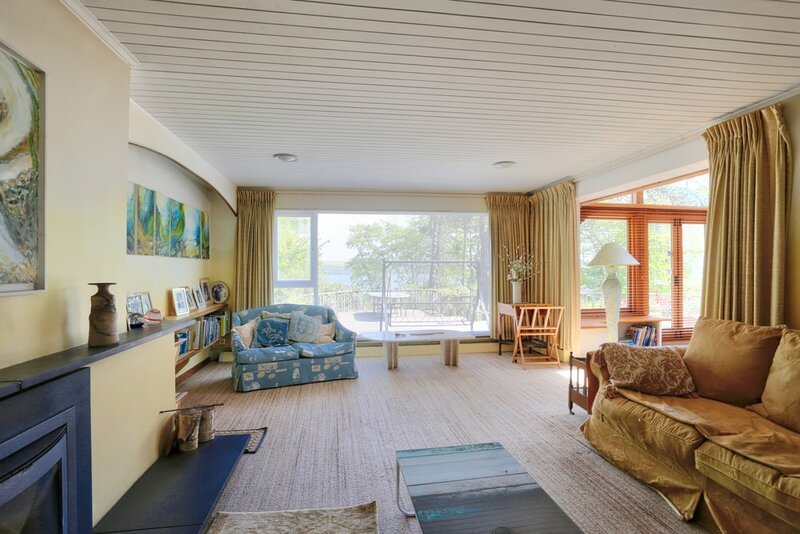 Slipways offers a rare opportunity to purchase one of the few remaining original properties on Restronguet Point. Indeed, Slipways was the site where the original landowner who owned the surrounding land chose his own home due to its sheltered position and far reaching waterside views. The house itself, although in need of some updating, has been cleverly designed to maximise the views out across the water. The property is situated in one of the most desirable positions on one of the most sought-after roads throughout Cornwall. Significantly the property includes an outdoor swimming pool, a private slipway leading directly into the Fal Estuary and Carrick Roads with an electric winch and running mooring (or outhaul) and a boathouse. Slipways has been in the same family for the past 36 years and has retained its original character. 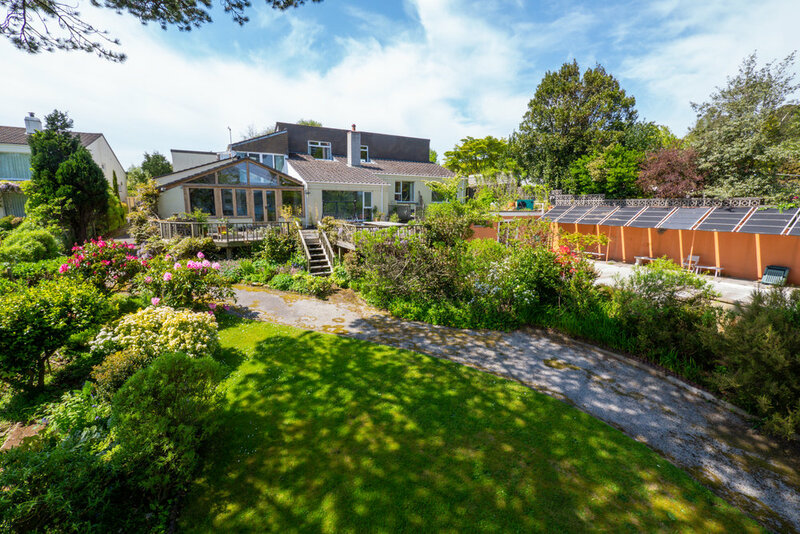 It has been cleverly extended and improved over the years including a magnificent oak-framed sun room (The Oak Room) which looks out over the Carrick Roads and principal bedroom and annexe on the first floor. On entering the property through private gates there is a detached garage with a driveway leading down to a double garage attached to the main house. The front door and porch lead through into a spacious hallway with steps leading down to an inner hallway and up to the first floor annex. 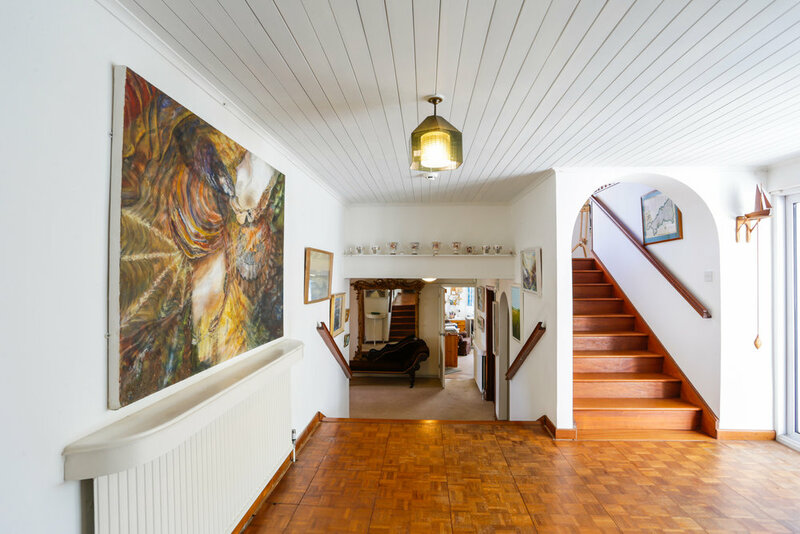 The first floor annexe consists of a sitting room with French doors leading out to a Juliet balcony with a view of the Carrick Roads and stairs leading up to a mezzanine room above. Beyond the mezzanine room is the principal bedroom with en-suite bathroom. The bedroom and adjoining rooms enjoy lovely views out across Carrick Roads to the Roseland Peninsular beyond. Off the hall on the ground floor is a corridor off which are three bedrooms, a family bathroom and a study. Off the lower inner hall is a cloakroom, a small piano room and two reception rooms; a sitting room and the Oak Room. Both reception rooms have charming views out across the decking and garden to the water and Roseland Peninsular beyond. The Oak Room is particularly special with doors leading out to the wooden terrace that faces south east. The dining room is situated behind the Oak Room with the kitchen behind that. There is a utility room and WC linking the kitchen to the double garage behind. On the sea side of the house is wooden decking and on the entrance side of the house is parking for a number of vehicles or boat trailers. Off the wooden decking is an outside swimming pool which is heated by solar water panels, adjacent to which is a pool house with a shower. A tarmac path winds its way down through the lovely mature gardens to a private slipway with a boat shed and electric winch. There is an outhaul or running mooring from the shore that belongs to the property. The current owner has paid for the continued use of a fixed mooring but this cannot be sold or transferred with the property. On the approach to the house is a greenhouse and vegetable patch behind mature hedging and a charming water feature consisting of granite rills flows through the garden. This leads down to a terrace to the side of the front door. Restronguet Point is a beautiful peninsular overlooking the Carrick Roads and Fal Estuary. It is designated an Area of Outstanding Natural Beauty and is an exclusive, much sought-after address. Moreover, the property occupies one the most private and secluded frontline, waterfront positions on the peninsula. The nearby village of Feock has a post office/ shop and the Cathedral City of Truro (6 miles away) provides the main business links for Cornwall and offers an excellent range of shopping, commercial and schooling facilities. This part of South Cornwall is perhaps best known for its wonderful sailing and cruising with deep water moorings and first class yacht marinas at Falmouth. The Helford Estuary is close by too, so enthusiasts are spoiled for choice. 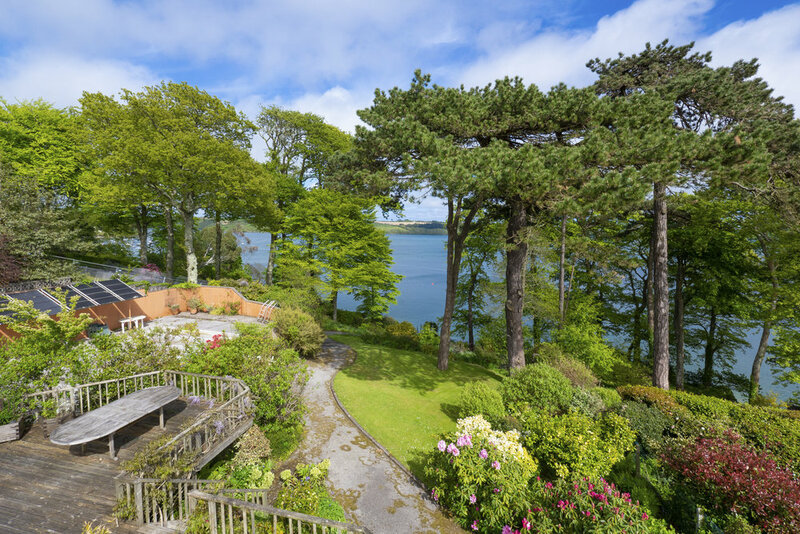 This area has one of the most wonderful climates in the United Kingdom, ensuring some of the most spectacular gardens in the country including five of national repute at Trelissick, Trebah, Glendurgan, Carwinion, The Lost Gardens of Heligan and Penjerrick. The Eden Project is also not too far away close to St Austell. For the sports enthusiast, there are several golf courses in the area including Trelissick, Killiow and Budock Vean. In addition to river and sea fishing, other water sports include windsurfing and water skiing in the waters overlooked by the house. Truro (only about 6 miles away) provides the mainline railway links to London Paddington (4 hours, 18 minutes). Newquay Airport (only 24 miles away) offers daily flights to London (London Gatwick in about 70 minutes) and a growing number of cities across the UK. Recent and on-going improvements to the main A30 Trunk Road now provide fast access to the M5 motorway network at Exeter. All items usually known as fixtures and fittings, whether mentioned or not in these sale particulars are excluded from the sale but may be available by separate negotiation. Such items include all fitted carpets, light fittings, domestic electrical items, garden equipment, statuary and machinery. We are obliged to let any potential purchasers know that an associate of our firm is related to the sellers of this property.